It’s not every day you get to sit across from one of the most phenomenal minds in the gaming industry, so when we got the chance to have a chat with Gran Turismo creator, Kazunori Yamauchi, we took it with open arms. We did our best warming up to him with a few questions about how he got into the industry and whether he figured himself to be a programmer or a business man, before we got down to the nitty gritty. Unfortunately, being the professional that he is, Yamauchi stayed tight-lipped about any of the new features to be applied to the recently confirmed Gran Turismo 6. He did, however, agree that the Gran Turismo franchise did not provide gamers with enough room to play around in the tuning of their chosen vehicles. He stated that it would be better for gamers to have wide freedom when tuning their vehicles, but that it all really came down to a battle against time. And anyone who remembers the number of delays the gaming world had to deal with before we got GT5, understands exactly what he means. That being said, if Gran Turismo 6 does show up with significant improvements in tuning, we’re totally taking the credit for suggesting it to Yamauchi. Hit the jump for more information on Gran Turismo 6. Gran Turismo 6 may have only been recently confirmed, but there are many that are already speculating as to what platform the game will be created for. Do we see another Playstation 3 game or will this one be reserved for Playstation 4. Well, if we take Gran Turismo history into account then it looks like it will shoot right into PS3. Polyphony Digital has released two games per console on the GT series and GT5 was the first game for the PS3. Moreover, Gran Turismo 6 may be the perfect opportunity for Polyphony to iron out all of the issues they had when Gran Turismo 5 debuted. After months of delays, fans were exasperated when they were met with long loading times, poor UI navigation, and standard vehicles, according to the most prevalent complaints. If memory serves us correctly, this was the same situation the company had when the original Gran Turismo was released. At that time, Polyphony took to the table again and released Gran Turismo 2, which was a more polished version of the original with a boatload more cars and tracks (Original GT: 178 cars, 11 tracks GT2: 650 cars, 27 tracks). The same can also be said for GT3 and GT4. Gran Turismo 3 debuted for the Playstation 2 with only 180 cars and 20 tracks, while the followup game, Gran Turismo 4, slaughtered those numbers with 700 cars and 51 tracks. The only problem with this theory is that Gran Turismo 5 already has 1,031 cars and 71 tracks, a significant increase from any of its predecessors, and that’s only the beginning. There’s more to come with every DLC pack released and Yamauchi himself even said that Gran Turismo 6 will get whatever cannot be updated to GT5 with a DLC pack, so we anticipate a lot more action during GT5’s time in the spotlight. It’s really a toss-up at this point. 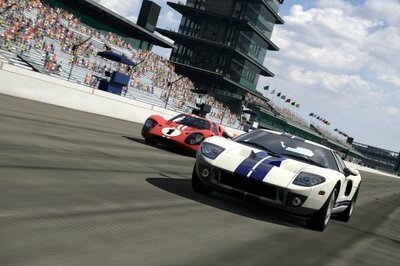 Kazunori Yamauchi and the rest of the brainiacs at Polyphony Digital may be packing whatever they can into GT5 to prepare everyone for the long wait ahead for completing the Playstation 4 and Gran Turismo 6 combo. Then again, Gran Turismo 6 could come out for the PS3 as a more polished version of GT5 with 2,000 cars and 100 tracks. Which would you prefer? Hit us up in the comments section below.